A cheerful and beautifully designed WordPress theme Allegro is a cheerful and beautifully designed premium WordPress Theme. Its bright color combination brings nostalgic feeling to your heart. 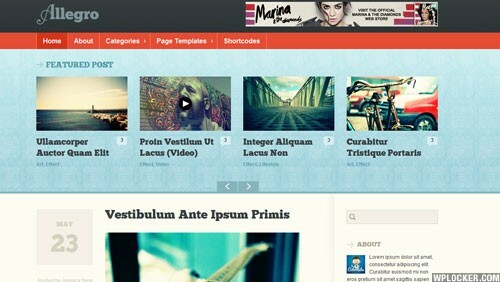 This vibrant colored theme is ideal for your blogging experience, both personal and professional. WordPress is the absolute best blogging platform and Allegro will make your site really stand out from the crowd.